SWTOR has a pretty active and awesome community of fan content creators, but as a blogger, things can still feel a bit lonely sometimes since so much of people's focus when it comes to content creation has shifted to podcasting and streaming/video-making these days. Well, in the month of August at least, no blogger has to feel lonely because Belghast of the Tales of the Aggronaut blog is hosting Blaugust! This used to be an event about posting every single day throughout the month of August, which is why I avoided it in the past to be honest - my days of wanting to post something every single day are long past me. - Encouraging people to blog, whether they are new to it or "hardened veterans". Most of the people involved write about gaming, but it's not strictly limited to that. - Exchange links to increase exposure of your own posts and to find new blogs to read yourself. - Share tips and advice about the subject of blogging (the event is also supposed to incorporate what used to be called the Newbie Blogger Initiative in past years). - Developer Appreciation Week! I quite liked that one last year. I signed up as a contributor, which doesn't really mean anything special for the blog as I'm not going to try to ramp up my posting frequency or anything, and I don't necessarily expect to make use of all the different writing prompts - but I will be mentioning the event every now and then and am fully planning to check out other people's blogs throughout the month. My blogroll could certainly do with some fresh blood. Recent social media kerfuffles have once again highlighted that for all the connections that social media provide, they can also be incredibly vicious and unpleasant. We tend to forget that every public Tweet we make is basically like shouting into a megaphone, because most of us only ever generate a very limited response. However, things could basically get picked up by the wrong crowd at any moment and then all hell breaks loose. I actually didn't know whether to be amused or sad the other day when in a discussion about this issue, I saw several people say things along the lines of: "If you just want to shout into the void without anyone ever responding, get a blog!" I mean, yes, you can make a blog that doesn't allow comments, but I think for most of us having comments enabled is part of the appeal. We do want to hear responses to our ramblings. Anyway, the nice thing about blogging is that you control the discourse. People starting to flood a post or the whole blog with unwanted comments? You can selectively limit them without breaking a stride when it comes to your own output. Also, personally I've found that even if you allow completely anonymous comments, it seems that the feeling of "being on your turf" somewhat discourages people from leaving outright nasty comments, at least compared to an open platform like Twitter or reddit. So again, to make a long story short: blogs are nice because they allow you to have public discussions with strangers but with a safety net. I wouldn't be surprised if people actually came to appreciate this more again with all the social media ugliness that we've been seeing recently. I get that not everyone is as interested in archiving and preserving their own words as I am (it's pretty conceited, isn't it), but a properly formatted blog is like a miniature library that makes the past both easier to remember and straightforward to navigate. Between an archive sorted by year and month, tags and the simple search function, I can find any old piece of writing that I want to revisit with ease. Likewise the few more useful posts that I've written are merely a Google search away from anyone else who might want to find them. One of the big problems I have with audio and video is that it's a pain to find things again later on. Ever felt your heart sink when someone tells you to check out so-and-so talking about such-and-such and they link you to a one-hour video without a clue of where the actually relevant part begins and ends? Or maybe you vaguely recalled hearing an interview in which something was said that you'd like to revisit... but you have no idea how to find it again based on that fleeting bit of memory alone. I've even run into it myself when recording my Pugging with Shintar videos, when I suddenly find myself thinking: "Didn't I talk about this before?" but I have no way of verifying my suspicion other than re-watching all of my old videos to find where it might have come up (which I usually can't be bothered with). Maybe this is something that technology will be able to solve with time, but I wouldn't hold my breath for it happening any time soon. For now, blogging is still the way to go when it comes to creating content that will survive the test of time. I suspect that one of the reasons that blogging and I suppose reading in general is on a bit of a downturn is that we live in an age of multi-tasking, where people don't feel productive if they aren't doing at least two things at the same time, and reading is really limited in that regard. You might be able to whip out a book while training on your exercise bike or something, but generally speaking, if you want to read something, you have to focus on it. This is a major advantage of podcasts and streamers, that you can listen to them on your way to work or watch a video while knitting a scarf. However, one of the big trade-offs that comes with this is that both watching and listening take far, far longer to impart the same information than the written word. I reckon that most blog posts I read throughout the week don't take more than two to five minutes to read, with many taking even less, while most podcasts and videos that pop up on my feed tend to range from fifteen minutes to an hour. 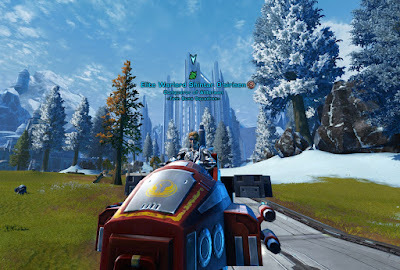 This is the main reason I'm really bummed that so many of SWTOR's content creators are focused on video these days - because while I'd be happy to say, read three blog posts about a new stronghold, I don't really want to watch three twenty-minute videos about said stronghold, even if they are all nicely done. Since each individual's content demands more time, I'm actually following much fewer of them than I follow bloggers, because there are only so many hours in my day - which is a shame in a way. Long story short: reading and writing allow you to share information much faster and with more people, with less time commitment required on the end of the consumer. Did I convince you to try blogging yet? 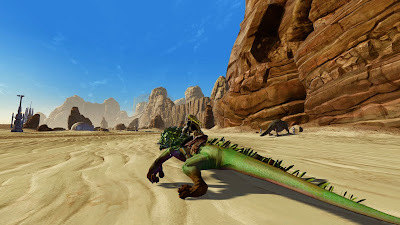 Well, even if not it might still be worth your time to check out the list of Blaugust blogs and read about other people's adventures in gaming at least (not necessarily in SWTOR). I promise it will take no time at all! Since at least one commenter asked about it: Yes, we won! To be honest, I was planning to write about it anyway; I was just very busy yesterday. Our lead held and we finished with a comfortable margin of victory. In fact, looking at the entire scoreboard at the end of the event, it was revealing and positively surprising to see that only six guilds in total had higher scores than us as far as I could see (there might have been another couple of high scorers on Imperial Balmorra and Taris; I didn't relog to check those), meaning that actually, we probably would have been able to take on some of those competitors we had so cautiously and intentionally avoided when choosing where to invade. Then again, some guilds' results are probably a bit deceiving - if they faced no real competition for their invasion target, they didn't have to try very hard to win - however, that doesn't mean that they aren't capable of scoring much higher when push comes to shove. I was so ridiculously happy with the result - I mentioned previously that I've taken up my old habit of tallying up total scores per legacy at the end of each event again - that I sent everyone who had contributed at least 15k points a thank you note in the mail. (As I did so, I learned that you can't send more than one in-game mail per minute, probably to counter credit spammers... let's just say that this resulted in a pretty long evening.) It seems a little silly if you think about how ultimately inconsequential the rewards for first place are... or if you're in one of the even bigger guilds who routinely win Conquest every week anyway. However, for us this was our biggest success to date, and I just loved seeing everyone work together and contribute in their own way: officers organising extra events to help people gain points, or guys who rarely bother with Conquest making that extra push to hit their personal target on at least one character, even if they weren't around to interact with other guild members very much otherwise. It's the sort of thing that really makes MMOs special to me and gives me warm and fuzzy feelings inside. Now we've definitely earned some rest until the next Total Galactic War though! This week the Total Galactic War event made its return. 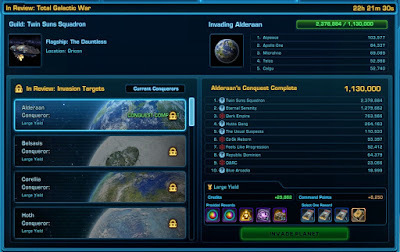 As I noted at the time, one of my biggest disappointments with the new Conquest system was that Total Galactic War had been turned from a huge, unique event into just another Conquest, and I said at the time that I was really hoping that Bioware would reconsider that change. And they did! 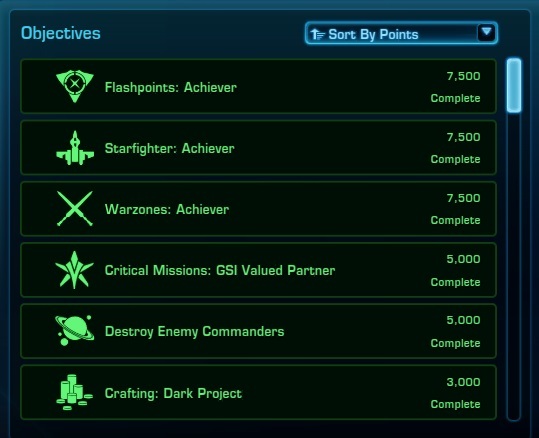 This week Total Galactic War broke out with a total of 19 planets up for grabs (21 if you count the faction-split Balmorra and Taris twice). I had completely forgotten that this was going to happen, so I came online on Tuesday to a lot of frenzied discussion among the officers about which planet to invade. Since I still think back on my very first Total Galactic War as one of my fondest Conquest experiences, I got super excited and immediately began studying the state of the leaderboards. 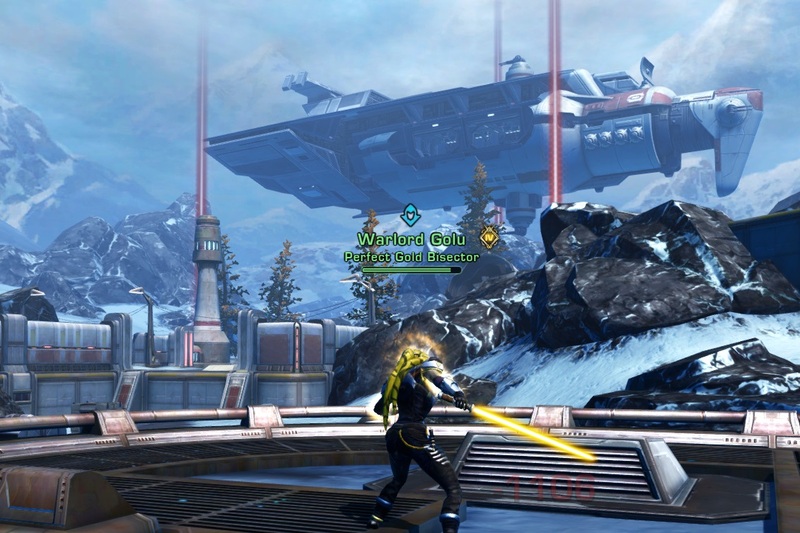 With SWTOR Conquest currently out of commission it was quite hard to judge the competition at times. While I've made a habit out of screenshotting the board at the end of every week since the new Conquest system was introduced and could therefore gauge some guilds' strength, others remained dark horses even so. Back in the day when it was all about getting into the top ten on the leaderboard, just finding a planet that wasn't too crowded was usually our main consideration, but with how much Twin Suns has grown lately and a mere top ten placement not granting anything special anymore, there was no doubt for us that we wanted to go for gold. Eight of the 21 planets are now large yield targets, seven promise a medium yield and six a small yield. And this is where the whole "hoping that large guilds will go for a large planet" system actually worked decently for a change. At least for us, it was clear right away that we didn't want to go for a small yield planet. If we didn't win first place, it would have felt hugely wasteful to have limited ourselves to a small reward, and also somewhat unfair to the smaller guilds who finally saw their big chance for a win in this event. 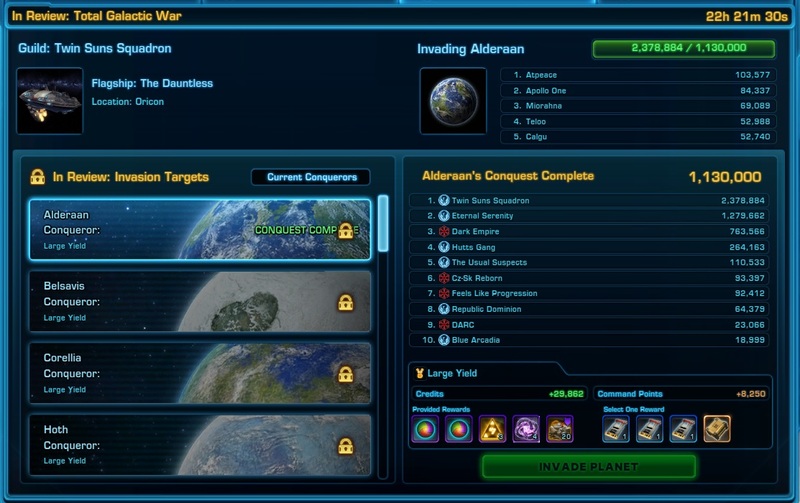 After much back and forth we settled for invading (large yield) Alderaan, where we knew that we would be facing another large guild as competition, but one I reckoned we would be able to beat if we tried hard enough. I don't want to jinx it because the event isn't over yet - knock on wood - but so far it looks like our gamble might have paid off, as we're sitting at a score of over two million at the time of writing this, while our nearest competitor only has achieved a little more than half of that. Those of us with an interest in Conquest have been banging on about it all week, asking every guildie to make at least a small contribution, even if Conquest isn't usually their cup of tea. With the event's activities being focused largely on dailies and small group content/PvP, there were certainly plenty of opportunities to take part. Trying to lead by example, I also leaned into it myself as hard as I could, and I'm currently on track to finish with nine characters having hit their personal target. It's certainly been an interesting experience - queuing for PvP comes quite naturally to me, but it was nice to have more guildies grouping up for it than I've seen in a long time. And while dailies are not something that I'm particularly fond of, it's not as if I dislike them so intensely that doing each area once this week would have been a major chore. I can't even remember if I ever did the new Makeb weekly after it was no longer staged, if not this would have been my first time. 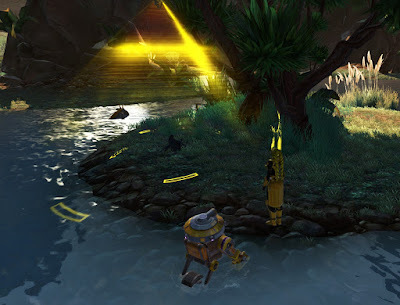 Somewhat bafflingly, there is virtually no difference compared to the old system except that you can pick up more than one mission at a time now, but since the quests themselves are the same, you still end up doing them one at a time as they all take place on separate mesas and don't overlap. 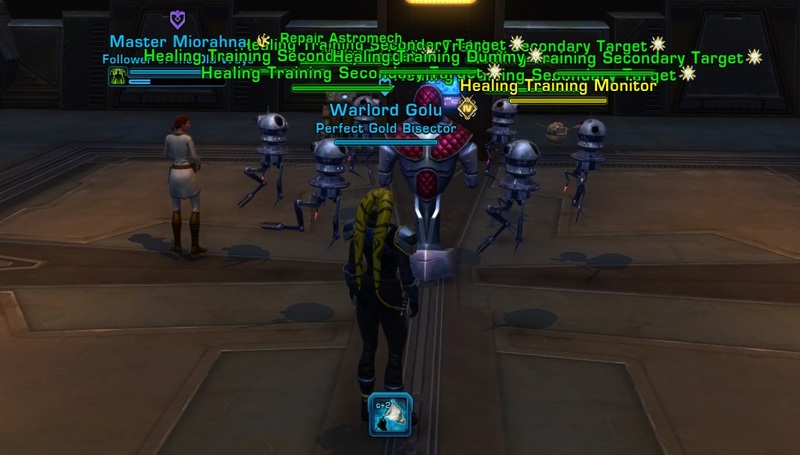 That quest to steal Regulator speeders in particular... oh my god! The GSI dailies are another piece of content that I hadn't done in a long time. 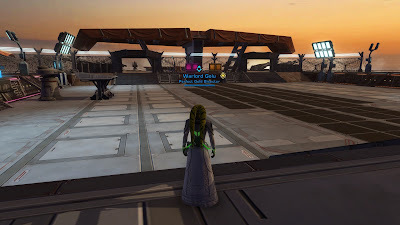 I know that FibroJedi likes them because most of them are effectively non-combat missions (except for the heroics and any mobs that might incidentally be in your way), which could be considered relaxing I guess. Looked at it from another point of view though, they are examples of the kind of old-school MMO quest design that many people hate, where you get sent all across the map just to click on something, with more time spent travelling than actually doing anything. 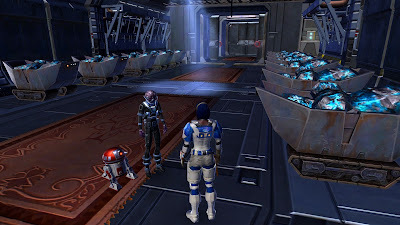 A lot of the missions are also bizarrely unintuitive the first time you do them - for example the original Seeker Droid quest chain teaches you to dig up objectives or treasure by placing your droid in a random spot and then following its indicators. However, the dailies don't work like this - instead they require you to (visually) find certain spots on the ground and plant your droid exactly on top of them. That's not a bad thing exactly, and I actually prefer it to the way the treasure hunting works, but without knowing this in advance, you could easily spend twenty minutes on your first GSI daily, wondering why your Seeker Droid is suddenly so useless and maybe giving up on the whole thing altogether before you've even really started. Doing the Macrobinocular mission to find "Big Red" on Alderaan also gave me flashbacks, since I remember that the first time I did it, I didn't realise that there were several map markers for this quest and that you're supposed to visit all of them and find at which point "Big Red" just happened to spawn that day. As a result, I thought the first marker I visited was the only one and spent twenty minutes unsuccessfully trying to scan random thrantas that were flapping around in the background, wondering why Bioware had made the objective for this quest so hard to target. Anyway, despite of these niggles about some of the quests, this week has felt hugely exciting for me in SWTOR, facing challenging competition for that first place spot on Alderaan and getting to revisit some older content at the same time. 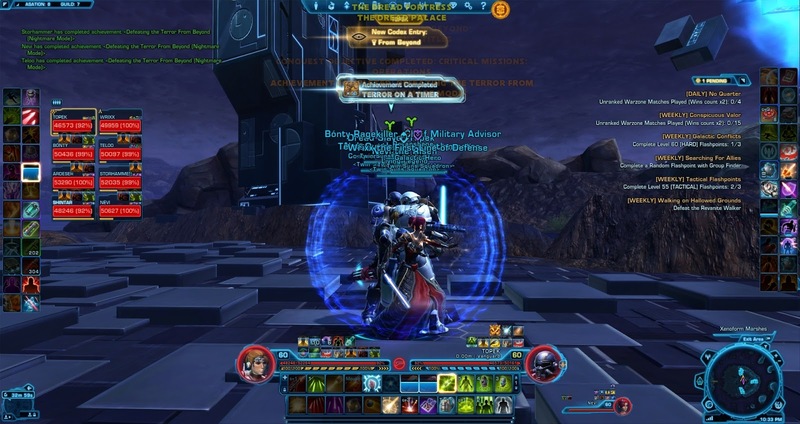 This past Sunday was a big day for my guild ops team (we are back to having two separate progression teams and I'm still getting used to everything we do not automatically equalling "the guild" anymore): We defeated the Terror From Beyond on master mode for the first time. Now, strictly speaking I got the achievement for doing this more than three years ago already, back when you could out-level the older operations to a certain degree and overpower them that way, before they were all level-synced. In fact, I remember a TFB run with some people who were taking such delight in how overpowered they were that they decided to ignore all the Terror's mechanics in the second phase of the fight and just plinked away at it despite of its large damage resistance until it entered the final phase of the encounter... and somehow, it worked. Sort of an achievement, dated February 2015, with us overpowering the Terror by five levels. However, this Sunday was our first time actually beating it at level, and boy, did it take us a long time. I didn't make a note of the exact date when we first started attempting the fight, but I do have some video footage that goes back as far as October. Now, we didn't literally spend nine months wiping on the boss - there were many weeks when we didn't even attempt it at all for one reason or another, such as not having enough people online, or not having a good team composition, or just plain old tiredness. However, we never seriously switched to a different progression target in all that time, so even without constant wiping on the same boss, nine months are a very long time to feel like you've basically hit a progression brick wall. In hindsight I think the biggest challenges for us were simply the fight's length (this fight was the reason I changed my video recording software from allowing me to save the last ten minutes of gameplay to saving the last fifteen minutes - because I realised ten minutes wouldn't be enough to capture the whole fight), and how many opportunities it gives you to die. It's not that there are any mechanics that are super tricky to execute correctly, but your mind wandering at a bad time during the fifteen minute duration of the fight could be enough to wipe the group already. We actually suffered far more deaths early in the fight than in the later phases, I think at least partially because people started to zone out from all the repetition, which just led to even more mistakes. So the final kill was super exciting to me, and as I often do I made a video out of it. Even at nearly twice the original speed it's still over seven minutes long, because that's just the kind of fight it is. I actually really appreciated the way it ended up challenging me. While I've always liked TFB as an operation, the final fight was never really one of my favourites because as a healer the second phase in particular is actually pretty boring. There is all this exciting stuff going on with people jumping around between platforms, but as a healer you simply don't have to. While working on this encounter however, we soon realised that the dps check was extremely high and even with all of our damage dealers trying their hardest, we were still a little off, which led to one of our members concocting a plan to get the second tank and one of the healers involved in adding more damage to make up the difference. As my usual co-healer is a Sage and it's a bit easier to add dps as a Commando due to the way the class manages its resources, I was soon instructed to run with the dps and hit tentacles in phase two as well (which you can see in the video). This was actually quite confusing to me initially as despite of all my years of playing this game I've very rarely done anything but heal in operations, and certainly not on the harder difficulties. On our first tries involving this new strategy I made pretty much all the newbie mistakes I'd seen damage dealers make over the years, such as getting slammed to death by a tentacle, accidentally jumping on a tank platform, or simply falling to my death at random after running off a platform at a bad angle. To my credit though, at least I didn't do any of those things more than once. In the final attempt I was playing it quite cautiously, opting out of dpsing a few times when I felt that a bit of extra healing was more important at the time, but in the end my contribution still made enough of a difference for us to get the kill. The whole thing did make me a bit philosophical as well though, because again: nine months. I'm actually kind of surprised we didn't end up losing more people during that time simply because they gave up hope / ran out of motivation. In a way this record-length expansion cycle is both a blessing and a curse: On the one hand it gives us extra time to work on bosses we never had a chance to down while they were current because there was always another level cap increase coming that changed up the game again. On the other hand... we spend ridiculous amounts of time banging our heads against the same bosses without going anywhere. Raiding is often considered a bit of a wacky pastime by many, but right now it feels even more insane to me than usual (even if I still enjoy it). A few days ago there was some excitement as Bioware opened up the Public Test Server to subscribers for the first time in quite a while. They had admitted several times previously that they'd somewhat fallen out of the habit of putting things up for public testing and said that they should probably get back into it. For me, it's been even longer since I even bothered with the PTS. Looking back at the PTS tag on this blog I wrote about going on there a few times in the early days, such as to test out the moods feature or to familiarise myself with free-to-play. However, my interest in doing this gradually decreased, and the last time I even mentioned the PTS was over two years ago (probably around the time Bioware last bothered with it). So there was much excitement about Bioware re-opening the PTS at last, especially since people got to preview the new stronghold on Rishi that will be released with the next patch. I'm still finding it hard to believe that they've given us three new strongholds within a year after there had been minimal support for housing for ages, aside from the release of new decorations on the Cartel market that is. I wonder if housing enthusiasts are more likely to buy Cartel coins than other groups of players? Anyway, you don't have to log onto the PTS yourself to get a look at the new stronghold because people have been going nuts posting about it (in my feed anyway). You can have Swtorista walk you through it, or Vulkk, or Kid Lee, or Dulfy, or SWTOR Central, and probably more. If you'd prefer a written summary with static images, Xam Xam has you covered. Despite of all this, I couldn't quite resist logging into the PTS myself, for old times' sake if nothing else. 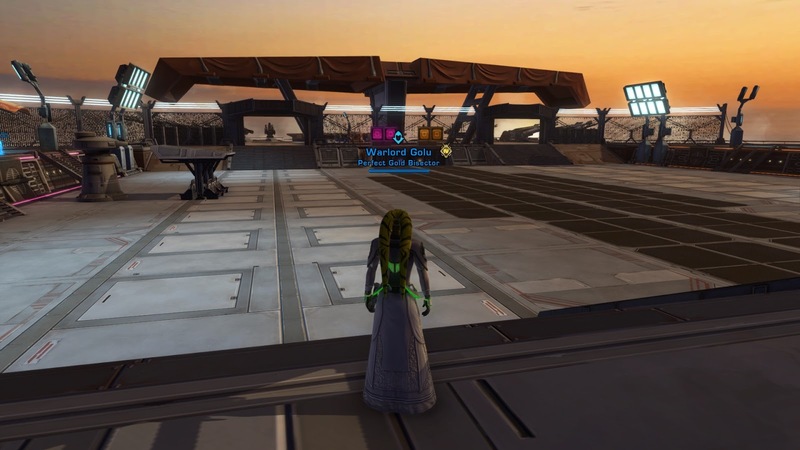 Cheers to Ondr the Scoundrel for being the only person online during that time who also happened to have their new Rishi stronghold publicly listed, allowing me to hop in and have a look around without having to bother with buying and unlocking it myself. I do have to say, the inclusion of the ability to set up custom PvP areas sounds extremely cool and actually very innovative as well - at least no other MMOs that I know of allow you to also turn your house into an arena. Unfortunately I'm afraid that it will see very little use. Sure, there'll be the occasional guild event or community tournament, but... I just can't get really excited about something that I foresee gathering dust 99% of the time, despite of how cool it is in principle. Am I at least excited about getting another new beautiful place to decorate? I'm embarrassed to say it, but: not really, simply because I eventually had to admit to myself that I'm not all that much into decorating. 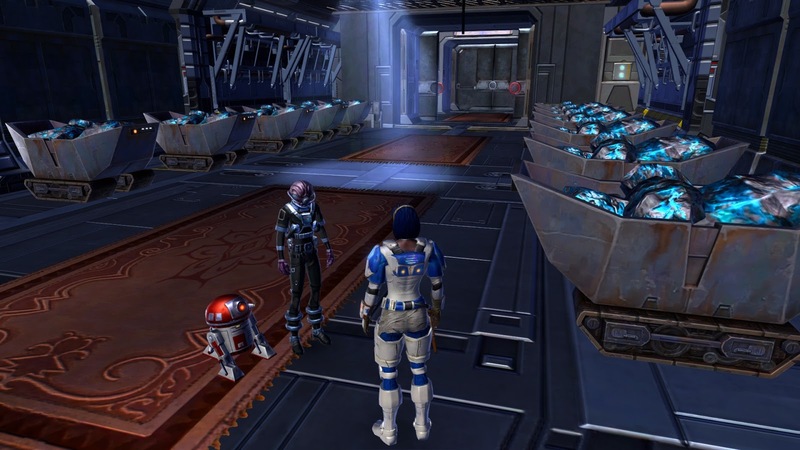 I adore strongholds for their practical features, which is why all my characters tend to log out in one, but I spend pretty much all my time in the first room of my Coruscant apartment (or Dromund Kaas for my Imperial alts). Despite of having fully unlocked every stronghold Bioware has ever released, most of them are virtually empty. The last "exciting" decorating project I engaged in was making one of the train cars on Umbara my "Baradium cart room" (Baradium carts being a common decoration drop from the Explosive Conflict operation that I have coming out of my ears). In short: The new stronghold is something that sounds extremely nice in theory but unfortunately I just don't see myself getting much use out of it, which is why I can't really get excited about it. As soon as I actually logged onto the PTS I also queued myself for PvP in hopes of actually getting to see some of the planned PvP changes in action. There were almost 20 people online on Republic side alone, so we would have had enough to get a match going... if everyone had queued up that is. I'm guessing too many were just sightseeing on Rishi, because just like in the old days, nothing popped. Unlike in the old days, Bioware does have dedicated PvP testing times these days, with the first one of these coming up tonight in fact - however, as it won't start until midnight in my time zone, this is unfortunately a no-go for me during a normal work week. However, there's already been talk of having more testing sessions, so hopefully at least one of them will happen at a time that makes it a bit more feasible for Europeans like me to also join. I'd really like to be able to make it one of these days, if for no other reason than to say that I did it. Has it really been one and a half years since I last posted about hunting DvL world bosses? Apparently it has. At the time, I mentioned that I was hoping to persuade my guildies to do more of them, but we never really ended up doing that. The CXP payout wasn't actually that good for the effort, especially after other activities got buffed, and the bugged achievement gave everyone the feeling that it was better to wait for it to be fixed before trying to kill any more of these bosses - until we just kind of... forgot. I actually have two more recordings like that lying around that I still need to trim and upload. Why? I'm not sure; these are hardly tough kills. 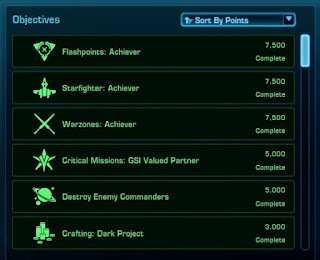 I guess I like to document my guild's achievements, but it also feels vaguely helpful to add these because there is still so little information about these bosses out there, especially with how apathetic Dulfy seems to have become about SWTOR (though she still posts updates about the Cartel Market and stuff like that). Even with beloved community members like Vulkk and Swtorista trying to fill in the gaps, Dulfy's guide to the DvL bosses remains the only one out there that I'm aware of, and it hasn't been updated in a long while, though some commenters have left useful tips in the comments. Those are easy to miss though if you habitually avoid the cesspit that's Dulfy's comment section. The bosses don't seem to be tied to specific planets. I guess I have no evidence that there aren't rules of some sort that prevent boss X from spawning on planet Y, but we've seen a bunch of different bosses spawn in the same spot as well as the same boss appear on different planets, so it's quite possible that anything goes. The bosses have at least two different sets of Force abilities, one that includes dropping lightning pillars on players and a Force execution like Raptus's from Dread Palace, and another consisting of a Trail of Agony type ability (like you get on the Revan fight in Temple of Sacrifice) and AoE damage over time. Getting stunned in a puddle of bad stuff is a real risk in either case and you've got to be ready to use your stun breaker quickly when needed or else you'll go down. It seems to me that this is less likely to occur if you bring more people to the fight, as it gives the harmful abilities the option to spread out more instead of one person getting targeted by several effects at once, but I'm not entirely sure about that. We've done several bosses with as few as eight people but they pretty much always involve someone dying and having to run back or needing revival. I probably shouldn't tell you this to avoid competition, but so far the Dune Sea on Tatooine has seemed like the best place to hunt, as it has at least five spawn spots in pretty close proximity, and people are less likely to engage and despawn the bosses by accident. I've actually done the latter on Hoth myself, when I mistook a world boss spawn for a random champion and didn't realise my mistake until my Sentinel had already leapt in and was Force-choked to death in short order. It also seems to me that the bosses are actually easier to kill on lower level planets. Sure, you get level synced, but we all know that being levelled down by a lot still leaves you pretty powerful compared to the average same-level mob, and on a lower-level planet this effect is more pronounced. In other words, I've noticed that we seem to do a lot less dying on Tatooine than on Hoth. All that said, we haven't actually engaged a single light side boss yet! I'm very much looking forward to seeing how those are different (if at all). Initially we were only going after the dark side bosses because most of us main light side characters and we were basically roleplaying our alignment, but lately the dark side has also been winning a lot, leaving us with no real choice.